This is a continuation of my series on the search for the perfect everyday camera bag, part 1. Peak Design's Everyday Messenger Bag - The flap is tilted because of a tall water bottle in the bag. Just looking at it, I didn't know how to open the bag. I pulled on the open tab and I still couldn't open the bag. Right away I had a problem: opening the package was quite a challenge. I hope I’m not the only one who had difficulty opening it up. It took me about 5 minutes to cut the tabs off to get in the packaging. Inside was the glorious Everyday Messenger Bag and Field Pouch. But it wasn’t love at first sight. I immediately had buyer’s remorse when I realized that there wasn’t enough room for my notebook or my favorite G-2 pens. Even though I had carefully checked the bag’s measurements, they wouldn’t fit. Most bags I’ve owned have a separate slot for notebooks. Since I often carry notebooks, I’m not able to use the dividers. This is something I should’ve thought of before I bought the bag, but I completely overlooked it. The main thing my daily bag needs to do it keep keep my camera safely protected in my daily work bag without making me look like an Asian Tourist. This sounds quite easy, but when you have OCD like I do, this can be a big challenge because I have many other demands as well. I want my stuff to be protected, easily accessible and organized, so I’m hard to please. There are a few things I didn’t like that caused me to have buyer's remorse. When I first got the bag, I had a problem. There was room for my 15” MacBook & charger, Kindle/iPad, Fuji X100s camera & lens adapters, and the hard drives. However, there was no room to put everyday stuff like pens or my Moleskin notebooks. So when I repacked everything from my backpack into the new bag, my notebook and pen had to be left behind. I wanted a small bag, but it was too small. That extra space was something I overlooked when I was searching for the bag, even after hours of research. However, there is a work-around. By taking out one of the dividers, I could just fit everything in. This wasn’t a deal killer, it was just annoying to me personally. Currently, I am using 2 dividers on each side of the bag instead of 3. The shoulder strap was also a bit awkward, but it looks cool. It’s a hyper-adjusting padded seatbelt strap. There weren’t specific instructions on adjusting the strap, so I did what I could to make it comfortable as possible. However, a few weeks later, Peak Design released a video on how to adjust the strap, and it made a huge difference. Ever since I was able to adjust it, I love the strap. I have to say, hands down, this is one of the best designed straps out there because it can adjust from being a short messenger-style to a full shoulder-length bag. The bag can get heavy fully loaded with gear and my 15 inch laptop. But it feels quite comfortable with the strap. You can also use the stabilizer strap to support the weight and the movement of the bag. I personally don’t use it, but I’m sure it’ll be useful for someone. 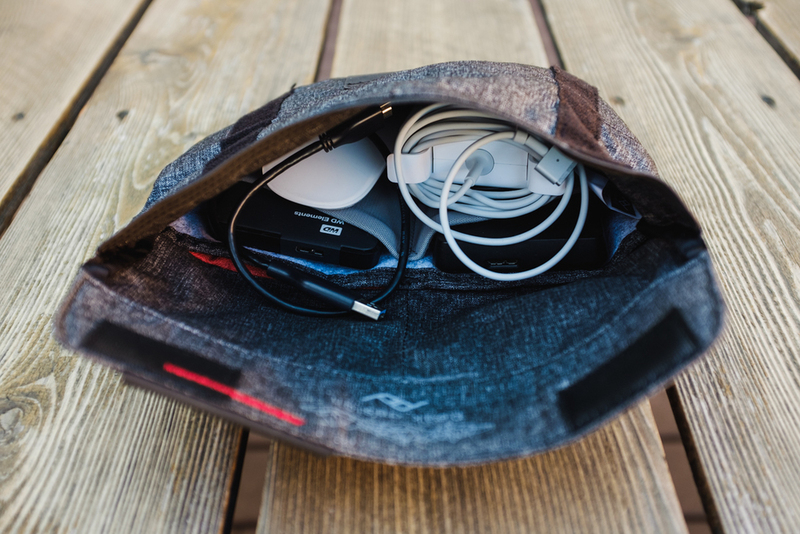 In the Field Pouch, which goes inside the Messenger Bag, I usually keep 1 or 2 external hard drives and the charger for my MacBook. 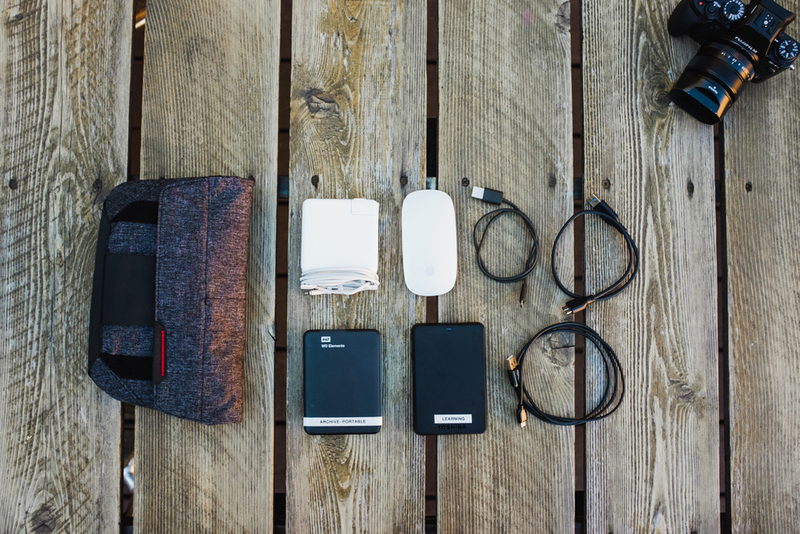 Inside of the Field Pouch, Apple MagSafe Charger, Apple Magic Mouse, 2 external hard drives, and cables. To me, this bag is a little wider than how I would like it when it’s full. Because the bag material is thick and sturdy to protect the camera, it is thicker than most messenger bags, including non-camera bags. When it’s loaded up, it looks bloated. But to my surprise, gradually I grew to love the bag more and more each day as I learned more about it. When Peak Design eventually released videos explaining the details of the bag, I finally discovered how the bag was meant to be used. Those videos kept me from reselling the bag. I finally understand how carefully the Peak Design team thought through the bag. Every little detail left me feeling good about using the bag. 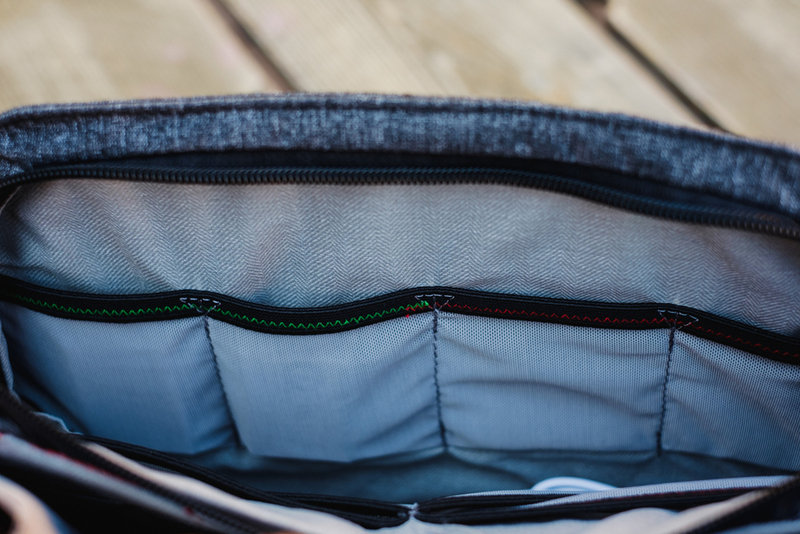 For example, there are small pockets for batteries in the front pocket. 2 of the pockets are stitched with green, and 2 are red. The purpose of that was to organize fresh and used batteries in different pockets. The dividers are also very useful, even though I can only use 2, and I change them constantly to fit my needs. They fold so many ways. I’m able to adjust them to protect my camera based on the size of the camera and lens. My typical setup for everyday use. Fujifilm X100s camera, Moleskine notebook with Pilot G-2 pen attached, Field Pouch, Shure E535 Earphones and Hydroflask water bottle. Not in the picture, Apple Macbook Pro 15" and Amazon Kindle Paperwhite in the back. My favorite part of the bag is the 2 ways to get in the bag. First is the typical messenger bag way of opening the flap. But I can also access the bag through the zipper at the top. It makes my life so much easier when I want to grab something quickly. Easy access to get the camera out without having to open the front flap. This is how I store documents and paper now. I have to be extra careful when I am storing a laptop in the pocket, not to crush the paper. In addition, the bag is waterproof. It’s wonderful that all of my gear is protected. I got caught in the rain with this bag, and everything was completely dry. The bag has already been the victim of heavy use from tossing it in the back seat of my car, where it has fallen to the floor multiple times. Also, I have dropped it by accident and nothing was broken or damaged. The field pouch is another awesome thing. It typically hold all my small junk, like my hard drives, the charger for my macbook, cables for my drives and other electronics, and my phone charger. Since these are small items, that crap usually got lost in the corners of my backpack. I wanted to have it one place and get it in and out. This bag does it for me. I take this bag out when I get to the studio and it holds everything in one place. This can also turn into a small bag. However, I am bit afraid to do this right now. If I use this as a small bag, it’ll definitely look like a cute purse on me. The Field Pouch fully loaded. The size is fully adjustable. Has this replaced my other camera bags? The short answer is no. I still own several camera bags and cases. And I don't think it was originally designed to replace it. I mainly use this bag as a work bag, like going home to studio or meetings, and as a second bag during my photoshoots. It's perfect for that purpose. Not everything will fit and I would have to stack the gear on top of each other. I like my gear to be laid out flat. But on a shoot day, the Everyday Messenger bag is very useful. I loaded this bag as my 'if my car was on fire, grab this bag'. I have my Macbook, Fujifilm X100s camera (as a backup body), the TCL-X100 Lens adapter (I am a portrait shooter, so this lens can be handy), and Hydro Flask bottle. The reason for this is to protect my laptop, since I never feel safe putting it any other bag. So in case of emergency, I can continue to shoot with this bag, even if my main camera bag went missing. Most of the days, I just enjoy having a camera with me. I love my Fuji X100S (no I won’t update to the X-100T, no need to, unless Fuji wants to send me one). Because I was forced to downsize my everyday stuff, it has been really good and I feel so much lighter. If I had one wish as a photographer, it would be to downsize all my gear into this bag. That would mean a camera body, maybe 2 lenses, a flash, MagMod, and triggers for my flash. But my insecurities of people judging me for lack of gear and not having all the fancy gear keeps me far away from that every day. To sum it up, this bag has been great in every way. It looks good (don’t mind all the compliments from you), and it serves my purpose well. It's just a fantastic bag. I can’t wait to take this on a trip. It would have been perfect to have on my last Colorado trip. Mount a tripod to this bag - my current tripod is enormous compared to this bag. I may need to purchase a smaller tripod. 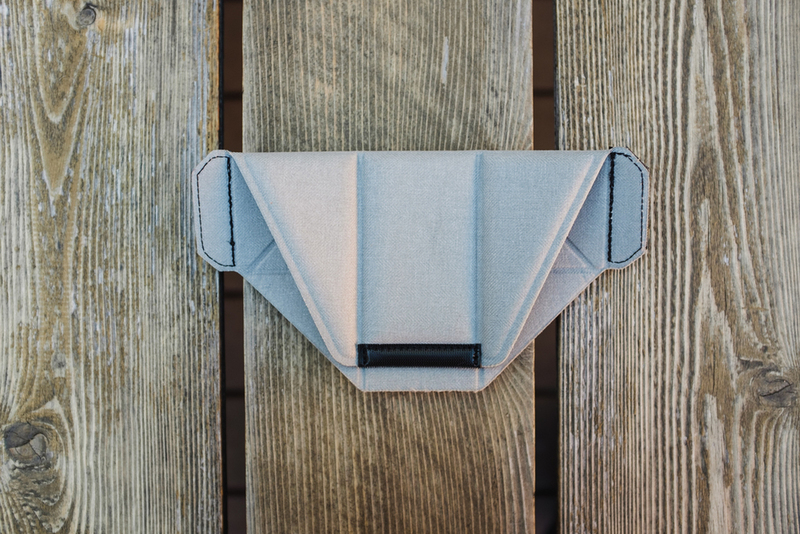 Buy a strap for the field pouch that holds my camera. I haven’t had the time to purchase and test that straps yet. Travel. I haven’t travelled with it yet, so I’m not sure how it holds up during a long trip. This is my photo shoot day bag 'if my car was on fire, grab this bag' - Hydro Flask water bottle, Moleskine Notebook, Pilot G-2 Pen, Shure SE535 Earphones, Apple iPad Air, UE Bluetooth Speaker, Fujifilm X100s, Fujifilm TCL-X100 Conversion Lens, Apple Lighting to USB Cable, Cable for the Raid thunderbolt drive, OWC Raid 0 Drive, Portable battery, Apple Macbook 15" & Charger. This is my everyday setup (light version) 'Gotta get business stuff done bag' - Amazon Kindle Paperwhite, Fujifilm X100s camera, Shure E535 Earphones, Hydro Flask water bottle, Moleskine notebook with Pilot G-2 Pen, Apple Magic Mouse, Apple MagSafe Charger, and Apple Macbook Pro 15"
This is my other everyday setup (heavy version) 'Gotta get creative bag' - Fujifilm X100s camera, Apple iPad Air, Apple Lighting to SD Card Adapter, Shure E535 Earphones, Moleskine notebook with Pilot G-2 Pen, Fujifilm Instax Printer SP-1, Apple Magic Mouse, Apple MagSafe Charger, and Apple Macbook Pro 15"
This is my travel setup 'Lets go somewhere bag' - Think Tank Photo Battery Holder, 4x Fujifilm NP-95 Batteries, Think Tank Photo SD Pixel Pocket Rocket, SD Cards, Moleskine notebook with Pilot G-2 Pen, Fujifilm X100s camera, Fujifilm WCL-X100 & TCL-X100 Conversion Lenses, Apple iPad Air, Apple Lighting to SD Card Adapter, Fujifilm Instax Printer SP-1, Portable charger, Apple Lighting to USB Cable, Apple MagSafe Charger, and Apple Macbook Pro 15"
Quick shoot setup "I don't have an assistant and need a quick shoot bag" - This loads up the bag very tightly. Think Tank Photo SD Pixel Pocket Rocket, SD Cards, Fujifilm X-T1 Camera, Fujifilm NP-W126 Batteries, Fujifilm 56mm, 35mm, & 23mm Lenses, 2x PocketWizard Plus III Transceiver, Sync cord, MagMod Gel Kit, MagMod Basic Kit (Grid, Gel Slot, & MagGrip), Lumopro LP-180 Flash, UE Bluetooth Speaker, USB Tethering Cable, and Apple Macbook Pro 15"
I’ve used this bag every day since I got it. There’s more to love then not. It’s been on set with me on shoots, at church, meetings, and at work. In every situation the bag was just fantastic, and it gets lot of attention from others. Funny note: this is the first bag my mom actually loves. She has never complimented me on any of my bags, but when we met for the holidays, she repeated talked about how good the bag looked. So in summary, this is a mom-approved bag. Is it a perfect bag? No. But it’s close, and it will be with me for a while. This should be the last bag I buy for awhile. Should you buy it? If you have a similar needs as me, then yes. But if you are just looking for a new gadget, I would say no. This bag serves a specific purpose, but it may leave you unsatisfied because it’s smaller than many other bags. These bags are loaded to the gills with features, and watching these videos will make sure you're an expert in every last one of them. This is the first of a multi-part series where I describe my search for the perfect photography bag. I am constantly searching for the ideal, everyday bag for my computer and camera gear. 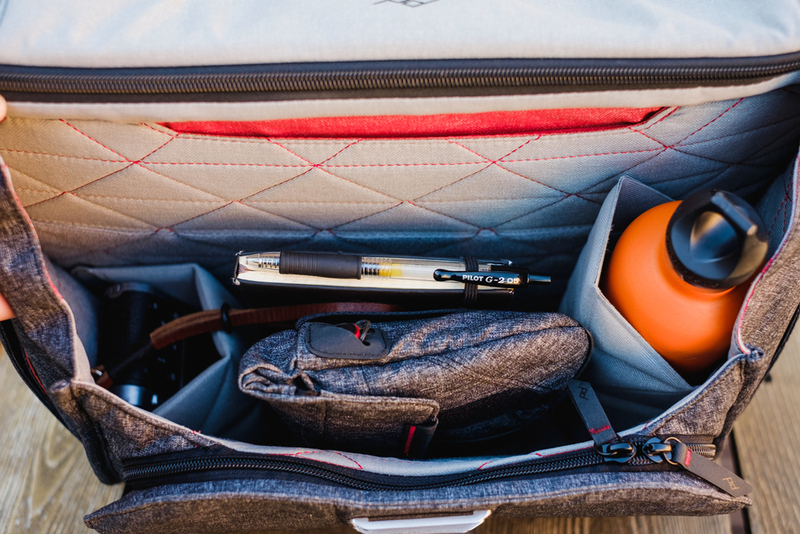 I love optimization and efficiency, so naturally I am always looking for new ways to pack and carry my equipment. This series was inspired by the awesome site Shotkit, a site discussing photographers and photo gear reviews. These are just a handful of the bags that I own and have used to carry my photography gear. My other bags were not included in this photo because there is not enough room to fit them all into one frame. My hope is that after looking at how my gear fits into each of these bags, you are better able to assess your storage and organizations needs and choose the optimal bag for your camera gear. Keep in mind that I’m a photographer who typically commutes to photoshoots by car, and my gear needs and preferences are probably different from yours if you do not. Also, I shoot with Fujifilm cameras (X-T1 and X100s), which are smaller than a typical DSLR. For photoshoots, I rotate through a few additional different bags and cases depending on the size and style of the photoshoot. It can go from a smaller bag for my 2 cameras and 4 lenses, to a literal pile of bags, with a bag for my camera, a bag for my 3 lights, and a bag for stands. I also bring apple boxes, softboxes, a cart, and a grip kit. But on non-shoot days, I like to carry at least one camera with me since I’ve been caught more than once needing a camera and not having one. After much trial and error, this is my best everyday gear setup yet. Someday I would like to show up to a job with only this gear because it’s what I mainly use on each shoot, but I still feel very insecure about carrying so little because I think that clients are expecting a bigger setup. One day though, I’m determined to do it. If you are reading this, you either have this bag already and have buyer's remorse, you are interested in buying the bag, or you (like me) have an addiction to bags. I hope I can answer some of your questions and fill in the gaps of all the reviews out there. Carrying around my gear in my Jansport Watchtower Backpack while scooting around Chicago. 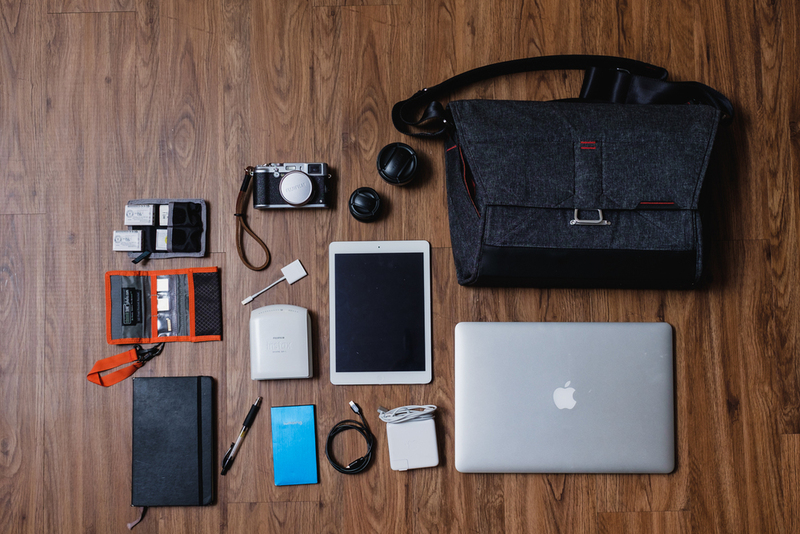 For almost all of 2015, I was on a search for the perfect bag to carry my camera equipment in for everyday use. I do have a fairly inexpensive backpack (a $100 Jansport Watchtower Backpack) but there was one thing that was missing: I couldn’t carry my beloved Fuji x100s camera around daily since it couldn’t be securely protected in my bag. I spent many days and nights reading reviews and watching review videos about all kinds of bags. I bought and returned many bags in search of finding the perfect match. For my birthday, Sojung got me a small ONA bag, The Roma bag that fits inside of my backpack, but the bag itself was so big that it ate up most of the space. And I couldn’t carry the ONA bag around by itself because it doesn’t have a shoulder strap. Also, when I carry any kind of obvious camera bag, I look like an asian tourist, which is part of my problem in finding the perfect bag. There was one bag that came close to meeting my space, design, and camera protection needs. It was The Union Street bag from ONA. There was lot to love about this bag. But I still couldn’t get myself to buy it because it was pricey (at $299) and too trendy for my taste. But one day I saw a post about a new bag made by Peak Design. I was very excited to see that Trey Ratcliff, a talented photographer, helped design the bag with the Peak Design team. After going back and forth for a week, watching 1.5 hours of Youtube videos reviewing the bag, and reading every review and article I could find, I pushed “Pledge” on their Kickstarter Campaign and ordered the bag. My order came included one of the first bags they produced, as well as a “Field Pouch” (a versatile, wearable accessory pouch) included with the bag. I couldn’t wait for the bag to finally arrive. After 2 LONG months of waiting, I finally received the package at my studio. Even though I was super excited, I didn’t open it right away. I wanted to make sure I got my work done before I spent rest of the day exploring with my new bag. 2 hours later, I finished all my work and finally opened the package. These adorable girls are my nieces. Their photos are on my website and frequent my social media. My sister loves that her girls have a professional photographer for an uncle, but not every photo is perfect. Last Christmas, I had a very stressful photo shoot with them. Shiloh is seven so she was very well behaved and knew what to do. But Skylar, who is four, threw a huge tantrum. She refused to be photographed and cried for more than half an hour. That's why you Shiloh looking so elegant in her Christmas dress but Skylar with her back to you. Yet another one from the day where Shiloh smiled her big smile, as usual, but Skylar would not even turn around. Later, I found out it was because my studio lights seemed too big and scary to her. She really taught me a lesson about photographing children after I have already been doing so for a couple of years now. A non-threatening object can look like a monster in the eyes of a child. For next time, I need to make sure the children I photograph are not afraid of my lights and if they are, I need to be more intentional about getting them used to it. If that does not work, I will need to try to hide the lights behind something or take them outdoors. These photos were taken on Fujifilm X-T1 camera with Fujifim 56mm f/1.2 lens.